The reactive oxygen species are mainly singlet oxygen ('O2), superoxide radical (O2-), hydroxyl radical ( OH) and hydrogen peroxide (H2O2) which are by-products of normal aerobic metabolism such as respiration and photosynthesis. Their steady-state levels are determined by the interplay of different ROS-producing and ROS-scavenging mechanisms. This balance is maintained by enzymes such as superoxide dis-mutase (SOD), which remove O2- radicals, and catalase (CAT), peroxidase (POX), and peroxire-doxin, which decompose H2 O2 and use metabolites such as glutathione (GSH) and ascorbate (ASC), to control ROS accumulation in different subcellular compartments. An excess of ROS is dangerous mainly because of reactions with lip-ids, proteins, and nucleic acids, giving rise to lipid peroxidation, membrane leakage, enzyme inactivation and DNA breaks or mutations, which can cause severe damage to cell viability. Subtle control of ROS production enables these species to act as signaling molecules which are involved in the regulation of processes such as mitosis, tropism, cell death and cell response to biotic and abiotic stresses. Compared with other ROS, H2O2 is a relatively long-lived molecule that is able to diffuse across cell membranes and acts as a signaling molecule during growth and development (Van Breusegem and Dat 2006). 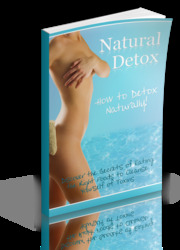 However, although we have a clear understanding of the toxic effects of ROS induced by metals as well as detoxification mechanisms, information on their role in regulation and signal transduction under metal stress remains quite limited. The electron transfer chains associated with chloroplasts and mitochondria are the main sources of ROS generation. However, this view has changed and the oxidative metabolism of peroxisomes is now seen as a very important source of ROS under different stress conditions (del Río et al. 2006, 2009). 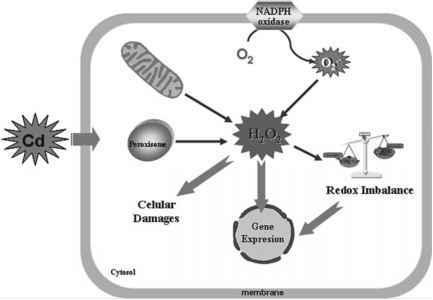 In peroxisomes purified from pea leaves, a Cd-dependent increase in the H2O2 concentration was observed, mainly as a result of the activation of glycolate oxidase, a key enzyme in the photorespiration cycle (Romero-Puertas et al. 1999) . In pea leaves, it has been demonstrated through the use of a cytochemical approach that Cd-dependent H2O2 production occurs in peroxisomes, in the outer mitochondrial membrane, and mainly in the plasma membrane, where the NADPH oxidase (NOX) is the main source of ROS (Romero-Puertas et al. 2004). In peroxisomes, H2 O2 was located in close contact with other organelles, which suggests possible cross-talk with other cell compartments (Romero-Puertas et al. 2004). In mitochondria, the Cd-dependent H2 O2 produced could be because of increased O2- production at the complex III site of the electron transport chain, as reported in animals treated with Cd (Wang et al. 2004) and also suggested for soybean roots (Heyno et al. 2008). H2O2 was also observed in the tonoplast from bundle sheet cells and plasma membrane from epidermal and transfer cells (Romero-Puertas et al. 2004) . Cd-dependent superoxide radical accumulation was demonstrated in the tonoplast from bundle sheet cells and plasma membrane from mesophyll cells, although the source has not been identified (Romero-Puertas et al. 2004). Accumulation of both H2O2 and O2-was also observed in vascular tissues from Cd-treated pea plants using confocal laser microscopy, electron microscopy, and cytochemistry (Romero-Puertas et al. 2004; Rodríguez-Serrano et al. 2006, 2009). This ROS accumulation is associated with lignifications processes which are highly active in vascular tissue under physiological conditions and are also induced in response to metal toxicity (Schützendübel et al. 2001; Rodríguez-Serrano et al. 2009). Results using different inhibitors and modulators of signal transduction demonstrated that the earliest control point in ROS production induced by Cd is at the level of protein phosphorylation/dephos-phorylation. A comparative transcriptomic study using different metals and sodium chloride in Arabidopsis thaliana showed that Cd specifically induced genes coding kinases (Zhao et al. 2009), which demonstrates the importance of these processes in regulating cell response to Cd. Calcium ions are also important in the regulation of ROS production induced by Cd, and cGMP is also involved in this process, probably as result of a transient increase in Ca2+ concentration (Romero-Puertas et al. 2004) . Fig. 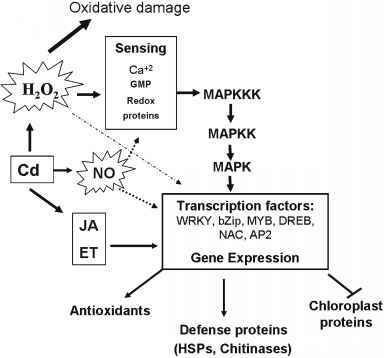 9.1 Sources of reactive oxygen species activated in response to cadmium. Cd-dependent ROS production takes place in different compartments: plasma membrane-associated NADPH oxidase, electron transport chain from mitochondria and peroxisomes (mainly glycolate oxidase). Overaccumulation of H2O2 produces redox imbalance and oxidative damage, but also can regulate gene expression in order to improve plant survival electron transport chain stimulate a second wave of ROS production possibly because of an increase in the semi-ubiquinone radical concentration (Garnier et al. 2006). A third wave of ROS coincides with cell death and involved membrane peroxidation as a result of increase in ROS production caused by mitochondria (Garnier et al. 2006). Remans et al. (2010) have recently demonstrated a Cd-dependent induction of NOX and differential regulation of gene expression by Cd and Cu in Arabidopsis plants and have suggested a link between NOX and lipoxygenase gene expression. A diagram showing the different sub-cellular locations of ROS production is provided in Fig. 9.1. The inhibition of antioxidative enzymes may also lead to a cadmium-mediated increase in the level of cellular ROS (Sandalio et al. 2001, 2009; Romero-Puertas et al. 2002; Schützendübel and Polle 2002; Benavides et al. 2005). One of the consequences of plant cell exposure to cadmium is the rapid consumption of GSH for sequestration of the metal and synthesis of PCs. This limits the GSH level required to maintain the redox balance of the cell which then increases ROS accumulation (Romero-Puertas et al. 2007a, b).